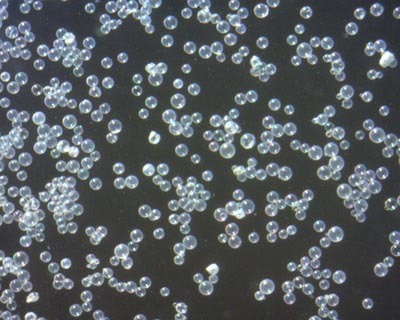 Photocatalytic Microspheres also known as Photospheres are hollow glass microspheres coated with photocatalytic titanium dioxide (TiO2). Photospheres provide a hydrophyllic, buoyant, filterable and reusable alternative to solid titanium dioxide nanoparticles for photocatalytic water treatment. Their buoyancy also enables application in open water systems, such as tanks, ponds and lakes, where solar UV wavelengths stimulate the photocatalytic activity. Photospheres show excellent photocatalytic activity against a range of water industry relevant organic pollutants and have also been demonstrated to be effective in reducing gaseous pollutants. The titanium dioxide coating on Photospheres is continuous, smooth and robust and does not shed into the treated water.